CROSS COUNTRY The Brahmas battle several leg injuries; some unable to compete for the season. From left to right Harrison Thayer, George Rosales, Thomas Ear, and David Montoya prepare for last Saturday’s meet. 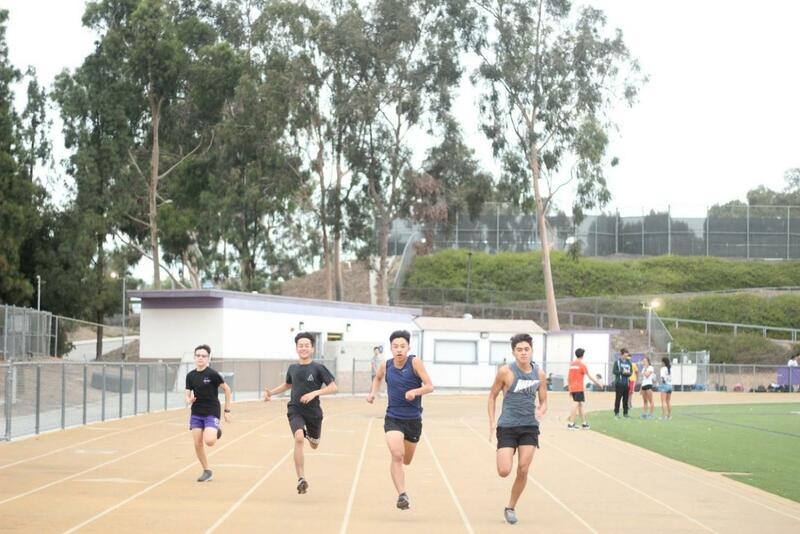 The Diamond Bar High School cross country team started its first few meets on the right foot despite dealing with injuries. After the boys and girls varsity team took first and third, respectively, in their first league meet at Bonelli Park, the team continued working on improvements through four days of intense runs—sometimes up to 11 miles long—and two days of lighter runs every week. The team’s performance at the 25th Annual Sunny Hills/Wayne Walker meet resulted in freshmen girls finishing third overall, led by freshmen Henna Gonzalo and Cassandra Jeon. The freshmen boys finished 11th overall, led by freshman Andrew Kim. At its second league meet at Bonelli Park, the team placed second overall with a score of 55, four points behind Chaffey High School. While the Brahmas did not have enough competing members to qualify as a team at their most recent competition, the 32nd Annual Bell Gardens Cross Country Invitational meet, top runners leading DBHS included seniors Thomas Ear, Allison Kang and Frederick Yang. Recently, the team has been facing challenges with several members recovering from injuries like Iliotibial Band Syndrome, a condition in which connective tissue becomes so tight that it rubs against the thigh bone, and splints, an injury resulting in pain along the inner edge of the shin bone. To prevent minor physical discomforts from becoming aggravated and growing into serious injuries, head coach Malinalli Cooke and the captains have been encouraging runners to notify them immediately if they notice any pain. “We have them do something a little easier, a little lighter, to help them recover [and] give them time to recover from whatever injury or whatever is nagging them,” Cooke said. According to Yang and Cooke, some of the team’s top runners includes seniors Ear and Kang, sophomores Lukas Amare, Allison Ear, Kaili Ishitani and Victoria Artale, and freshmen Henna Gonzalo and Andrew Kim.